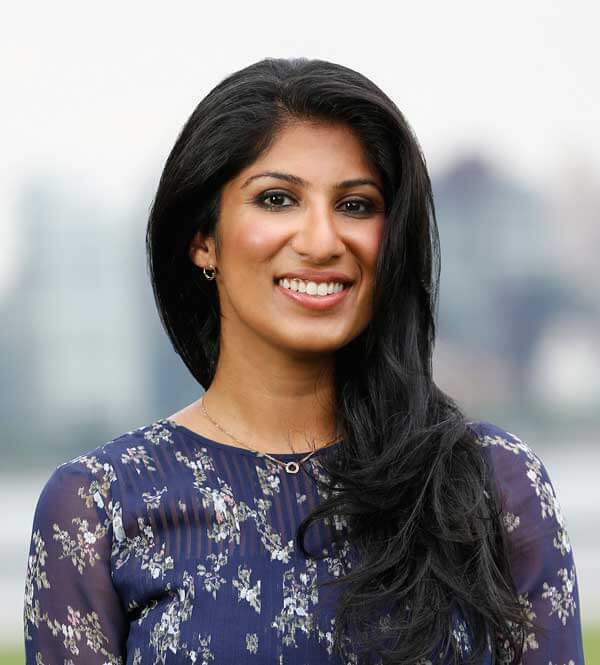 Dr. Radhika Kapoor, a Board Certified Pediatric Dentist, was born in New York City and raised in New Jersey. She has extensive experience and sincerity to pediatric oral health care. She is passionate about working with children and their families in a fun and gentle manner. Furthermore, Dr. Kapoor’s strong educational foundation allows her to share a wealth of knowledge of oral health as it relates to overall wellness. She earned her Bachelor of Arts degree in Psychology, focusing on areas of child development, at Barnard College, Columbia University, where she truly refined her education of child behavior and anxiety reducing techniques. She then continued at Columbia University to receive her Doctor of Dental Surgery degree. While at Columbia, she held leadership positions with the AAPD and Give Kids a Smile. She received numerous academic honors and was published in the NY State Dental Journal for her work on Ectodermal Dysplasia. Her passion for children’s dental health and community service was further solidified during her volunteer work, including a mission to Naranjito, Dominican Republic. She had the privilege of completing her pediatric dental residency training at well renowned Children’s National Medical Center in Washington DC, where she received extensive training and experience in treating patients with special health care needs, sedation, trauma, general anesthesia, and interceptive orthodontics. Inspired by her own personal struggles with nursing an infant with posterior tongue tie, Dr. Kapoor sought to enhance her training in CO2 soft tissue laser. In addition to years of continuing education and achieving proficiency in laser dentistry, Dr. Kapoor had the pleasure of having one-on-one training by one of the experts in the field, Dr. Martin Kaplan, who provided additional pearls of wisdom. Dr. Kapoor is pleased to provide CO2 soft tissue laser dentistry using the renowned Light Scalpel to her patients and their families. This has been instrumental in her tongue tie/lip tie frenectomy procedures, improving breastfeeding in infants, speech, feeding and airway issues in toddlers, and adult postural/sleep problems. Dr. Kapoor is currently affiliated with Englewood Hospital, helping children who are unable to be safely treated in the dental office. In the hospital setting, Dr. Kapoor provides full mouth dental rehabilitation under general anesthesia. Dr. Kapoor is also an active member of the ADA and AAPD and is credentialed in Pediatric Advanced Life Support and Basic Life Support. She looks forward to caring for your child and meeting your whole family.